In recent years, the advent of the information society has transformed attitudes. People now have easy access to an unlimited volume of information. More and more of them are becoming used to sharing their thoughts and opinions in blogs or social networks. Whereas authority figures previously played an essential structuring role, individuals today demand more autonomy, and increasingly have the means to assume this responsibility. This is generally considered to be a fundamental shift which profoundly affects how people see the world and interact with it. Yet, many businesses have not yet fully integrated this new context into their management model, and continue to be organized around an executive team that does the strategic thinking, defines a vision and then sets objectives for the rest of the organization to follow. When it comes to the outside world, many companies continue to see customers as an essentially passive population which must above all be convinced. - Create an organization that stimulates and develops individual engagement. More than ever before,employees must work in structures they can identify with and where they feel valued as individuals. - Bet on transparency. 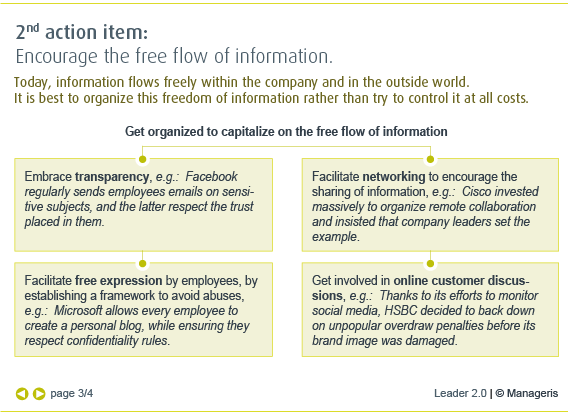 Often perceived as dangerous by management, the free flow of information, structured around a few simple rules, is generally a winning investment. - Bet on agility. 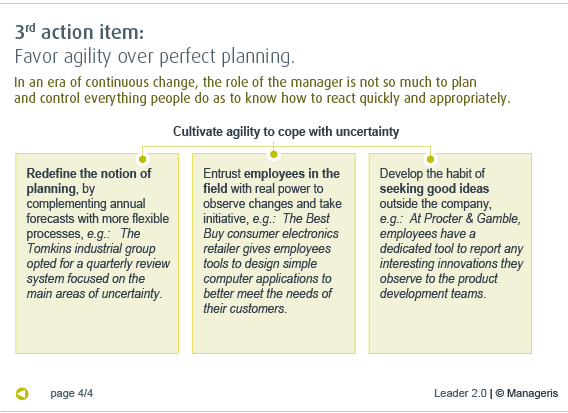 Rather than trying to project, plan and control everything, managers must give their teams the means to react to unexpected and unpredictable changes in their environment. How to apply an alternative vision based on long term-survival and development of company? Social media are truly revolutionary advances for companies. How to turn these social media into drivers of growth? 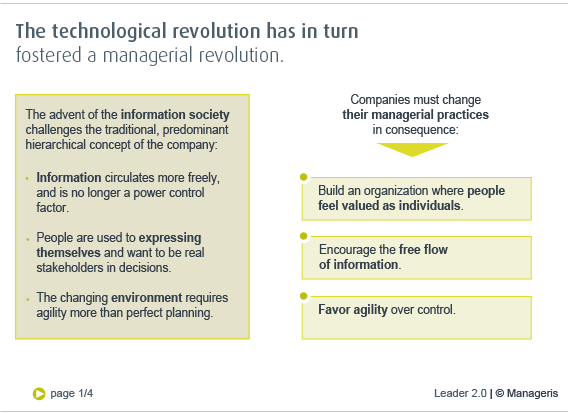 How to be a leader in the "web 2.0" era?